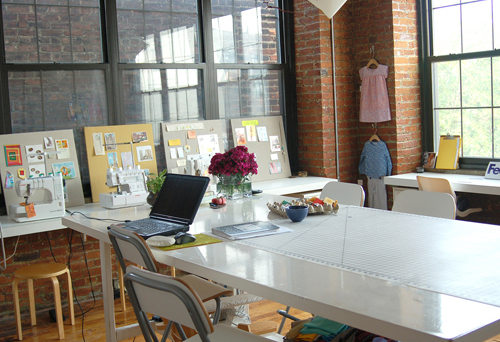 There’s something so refreshing about immediately connecting with someone, and I felt just that way about this week’s interview with Liesl Gibson, founder of the lovely children’s pattern company Oliver + S. Liesl is truly a warm, smart, and engaging person. Even though we’d never met, we easily fell into a groove of conversation about sewing for kids and ourselves, about motherhood, sewing in small spaces, and about Liesl’s expanding lines of women’s sewing patterns and her two fabric lines. I’ve admired Liesl’s Oliver + S patterns for several years, and now that I actually have my own little minnow to sew for (and endlessly play dress up with, at least until she won’t let me anymore! ), it was great to hear about her process. 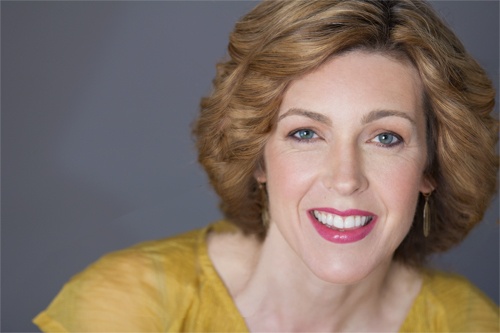 Liesl also has some great workshops on Creativebug that are definitely worth checking out! 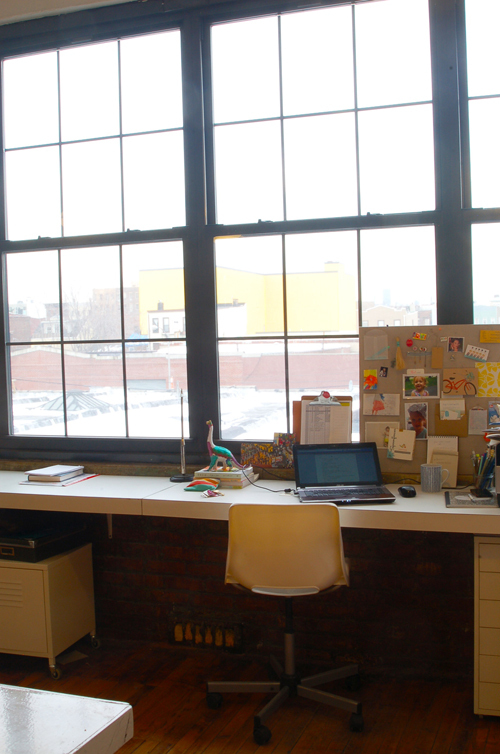 Although we met in Liesl’s apartment, she shared some pictures of her work studio in Brooklyn. 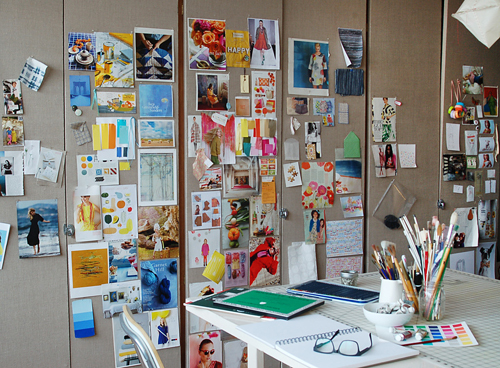 I love the use of inspiration boards on the walls and peppered throughout the studio. Happy listening! At the end of this episode, Liesl mentions two clothing designers she loves, Makié and Gary Graham. Although she does love Makié, she told me later that she meant to say Matta. All three make lovely clothes! Loved this episode! Liesl is so down to earth. Love it. I already have enjoyed her work, but this just made me like her even more 🙂 I felt like we were having a friendly coffee date with fantastic conversation! Thanks so much! This one was my favorite so far. What a lovely person Liesl must be! She has done some pretty amazing stuff, but with such thought and steady intention–such an inspiration. Thanks for these wonderful podcasts. I look forward to each one with much anticipation. I enjoyed this podcast very much! 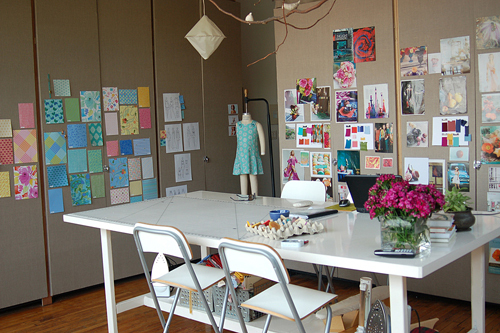 Thank you Liesl for sharing the photos from her studio. 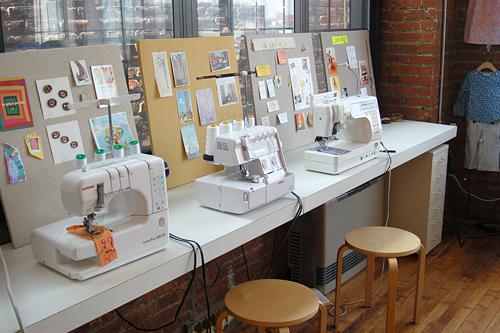 I would love to know what sewing machines she has in the studio. So glad you enjoyed this! I’ll ask Liesl about the machines! Glad you enjoyed! Keep listening!